The Commerce Shop team is excited to be at the 2016 IRCE (Internet Retailer Conference + Exhibition). It’s the leading eCommerce event and has a number of industry leaders participating, giving valuable take homes for all participants. We’re not only excited about meeting the industry experts, but also like-minded individuals- Like You. We have planned a great agenda and made sure we have some surprises for all of our visitors. 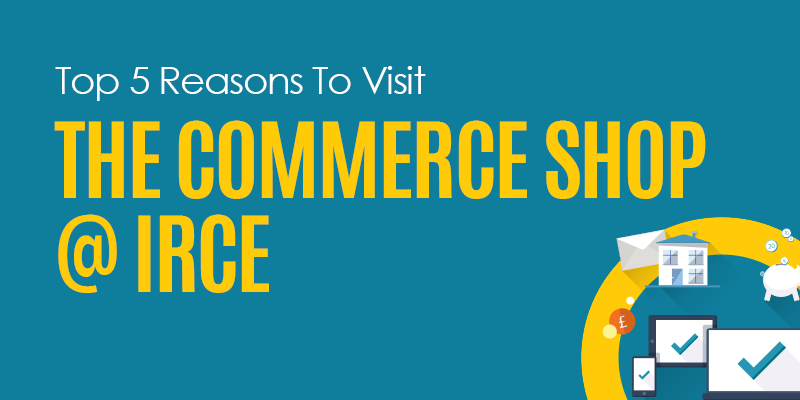 Here are the top 5 reasons you should visit us at IRCE. Conversion rate optimization is one of the biggest problems faced by the eCommerce industry. The average conversion rate of any eCommerce website us usually around 3-4%. This means that businesses fail to convert the remaining 95% of traffic that comes their way. It’s true that one cannot convert 100% of traffic, but by adapting the proper conversion rate optimization techniques, you can considerably improve your online sales. To help improve your conversion rate, we’re bringing our CRO expert to advice on what to do to improve your sales. But that’s not all!If you have a Magento website, you also get a chance to win a complete CRO audit – An extremely thorough audit, showing you what you can do better and what’s not working. The shocking truth is that nearly $4 trillion worth of products are abandoned annually. On the flipside, research states that 63% of these potential sales could have been recovered if the eCommerce business was a little more proactive. Imagine the amount of money you’re potentially losing by not getting back to those customers. Our new personalization tool does just that. Excited to learn more about the powerful tool? Then you just have to visit us at Booth #885 to learn more. Your old eCommerce strategy will not work in 2016. In this fast paced world, everything changes, including your customers. If you don’t keep up with the trends, you will quickly lose sales. We have been building eCommerce websites for the past 7 years and have witnessed the change in trends. Our eCommerce experts will update you on all the things you need to know to frame your eCommerce process and the marketing campaigns for maximum success. The Commerce Shop team has gotten a little generous this time, planning some amazing giveaways. While most are still a surprise, we just can’t keep this one particular giveaway a secret anymore – A $1,000 eCommerce Scholarship. This scholarship will be awarded to the most promising eCommerce website. It’s a great win as you get to learn from one of our top eCommerce experts, who will help teach you everything you need to know to make your website robust and to become a conversion magnet. Most of all, we’re excited to meet and greet you! We’re always excited to meet new people. We believe that even if we’re one of the best eCommerce solution provider out there, there is so much more we can learn from you. So come see us at booth #885. We would love to hear from you and also eager to solve all your eCommerce and CRO problems!